With this book in hand – and willing feet — you can explore the greater Richmond region. 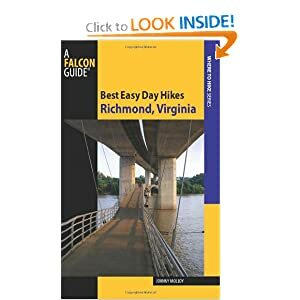 No matter where you go, the trails in this book will enhance your outdoor experience and leave you appreciating the natural splendors of Virginia’s capitol area. The gray boulder on Belle Isle sat perilously close to raucous rapids of the James River. I stood atop the rock looking northward across the water, toward downtown. The outspread landscape contained parts of James River Park, the location of many hikes in this book. My mind soared beyond downtown while mentally recounting all the scenic hikes of greater Richmond. Nearby, Gregory’s Pond lay silent beside the wooded trails of Rockwood Park. To the east the fountain of Dorey Lake greeted hikers. To the north, the green oasis of Deep Run Park shaded walking paths used by daily exercisers, while Three Lakes Park contained a watery trailside getaway. To the south stood the large jewel of Pocahontas State Park, where natural beauty overlain with the historic Civilian Conservation Corps past made the trail system a delight, demanding multiple hikes for inclusion in this book. Dutch Gap Conservation Area was laced with miles of alluring trails and a chance to visit a re-created English village from the 1600s. Dodd Park offered bluffside hiking along the Appomattox River and a fascinating boardwalk over Ashton Creek Marsh. The hikes at Petersburg National Battlefield explored Civil War history amid rolling hills divided by quiet streams. Other destinations were developed purely with recreation in mind. Hikers and mountain bikers enjoyed a network of hillside paths. I scanned west to Powhatan and Amelia wildlife management areas, where Richmond residents can enjoy rural walks in large preserved areas, maybe to spot a deer or wild turkey.